You’ll get a message that looks like this. Click “Allow”. 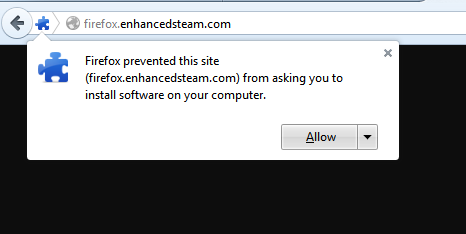 This new version of Enhanced Steam will now keep itself up to date automatically from this point forward. 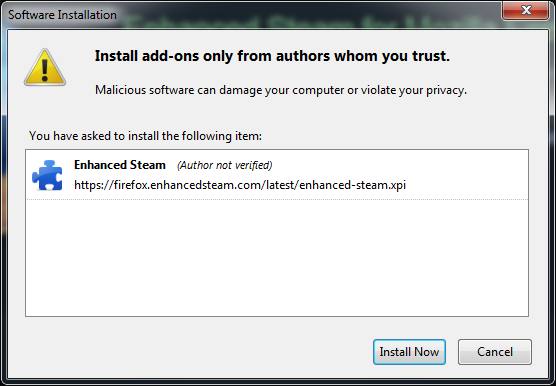 Mozilla has always been slow to approve new updates for Enhanced Steam. By installing the extension directly from the Enhanced Steam website, we can release updates more quickly in the future. There are also a number of Enhanced Steam features that Mozilla has made me remove from Enhanced Steam in order to comply with their publishing guidelines (not for technical reasons). By publishing the extension directly, we are no longer subject to this editorial process. This means that more of the features that have been only available in the Chrome version of the plugin can be ported to the Firefox extension in upcoming versions. What if I don’t trust you and want to keep the version I downloaded from Mozilla? That’s perfectly fine. But keep in mind, it will no longer be updated with new features and bug fixes. The latest version Mozilla has (v5.9.1) is also incompatible with Firefox version 29 and higher. If you would like to keep your existing extension and it’s current functionality, I recommend not upgrading past Firefox 28. Is the source code for this extension available to view online? Yes. You can find a copy of the source code here. It is released under the GNU General Public License. The description for the extension is misleading with the static message of “this version is out-of-date”, even when removing and reinstalling via your homepage. You might want to consider leaving such a message on the non-updated Mozilla build but pushing something less confusing in the builds you’re releasing direct.